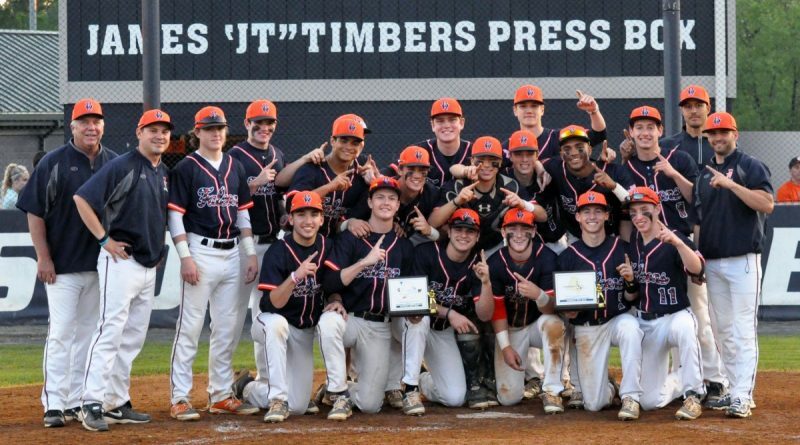 A 11-9 record in 2013 was only time Briar Woods’ baseball teams posted a winning season—until this season. This Falcons team predicted its own success beyond a winning record: They wanted to be the champs. To be the best by beating the best. To make the school’s first run to a state championship. And by winning the Conference 14 Championship game against Stone Bridge, they achieved just that. This year’s team, stacked with strong senior leadership, talented juniors on the rise and a crop of hungry, play-making sophomores consistently outworked their opponents to a 17-4 record. The morale, heart and talent of this team led them to more than a few come-from-behind victories and solidified their bond as the best squad Briar Woods has ever fielded. A strategically crafted line up left no safe havens for opposing pitchers; with strong hitting and skilled base running in the top, middle and bottom of the order- these young men drove each other to rack up the best season record in the school’s history. Stand out hitting was a factor all season. Home runs courtesy of senior Gino Ventrice, sophomore George Rosales, senior Caleb Barnes, junior Mike Ludowig, senior Zach Covert, and junior Jake Kleifges showcased the power these sluggers brought to the plate. Zach Covert lit up the boards with back to back triples in the Gavin Rupp tribute victory against Stone Bridge. Sophomore Johnny Richardson came through with multiple big hits resulting in game changing RBIs. Nathan Davis unfailingly stayed hot scoring his teammates with alarming regularity- which is why the packed Briar Woods stands were shocked when Stone Bridge decided to intentionally walk Barnes to get to the Falcon’s most consistent hitter. His base clearing off the fence double that broke the 2-2 tie and put the Falcons up 5-2 proved that to be a fatal decision. Solid defense was a key component in outscoring their opponents 129-59 in 21 game, never allowing a team post double digits against them, and allowing an incredible average of under 3 runs per game. Rosales was a wall behind the plate throwing out multiple runners at first and second base. Multiple highlight reel infield plays from Kleifges, Covert and Davis punctuated their victories, with junior Matt Lord pulling off multiple seam-splitting stops at first- there was never a doubt that the runner was out if the ball headed toward his glove. The outfield stole hits from opposing teams by tracking down balls with laser focus: senior Jacob Hand literally covering centerfield from end to end, senior Gino Ventrice controlling left, and junior Ludowig in charge in right field- all went error free. Pitching has been a thing of beauty this season with the winningest pitcher is school history, Caleb Barnes, leading the charge with 5 wins this season. Four junior pitchers throwing in the mid-80’s, and returning next year to defend this championship made a loud impact: Tyler Germanowski locked down the win in the regular season finale against Broad Run, Sean Clark and Jack Jaekle with three up, three down innings breaking the competitor’s spirit, and Mike Ludowig regularly shutting ‘em down as a strong closer. Briar Woods appears in the school’s first baseball regional on Thursday, May 26 at 6 p.m. at Falcons Park.